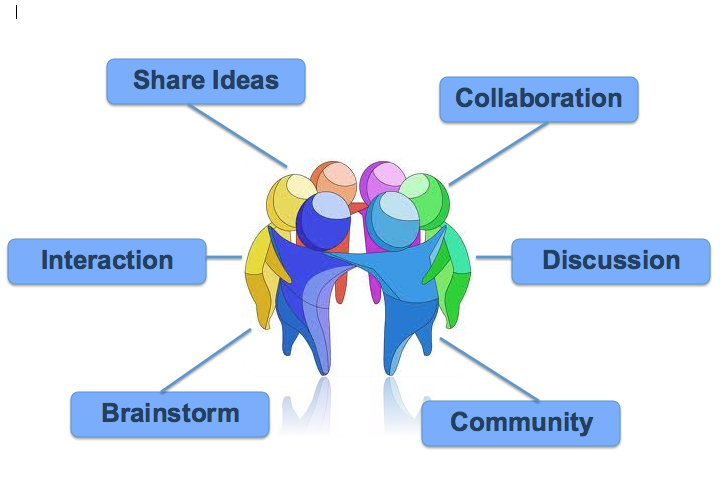 At the heart of a Collaborative Group Learning Process and Pedagogy is a core group of 6 unique learners, a Learning Set. Engineering and facilitating learning which utilises the Learning Set to its full potential can take a range of forms. From group problem solving and group based research challenges, from group construction of artefacts to the upscaling of knowledge, reciprocal reading to peer assessment and from editorial teams to musical ensembles. These approaches, be they cooperative or collaborative in nature, have shown to yield interesting results in terms of both measurable achievements in academic progress and attainment as well as tangible developments in an individuals capacity for learning lifelong-lifewide. Learning as, with and because of such a group, be it labelled a network, a community or a Learning Set, has also generated some interesting challenges and questions for those working within and with such groups. Planning for and managing learning, engaging the disparate learners within each Set and, for the students themselves, dealing with the reality of learning with the same people day after day requires a shift in often entrenched norms for students and teachers alike. Beliefs, attitudes, actions of both the individual learner and teacher can impact significantly on the affect-effectiveness of the Learning Set as its members learn across the Continuum from a Group to Liberated state of learning. This article aims elaborate upon the three principals that shape the construction or if you will engineering of these groups, sets, these ‘communities of learners’. As discussed in previous articles what the Learning Set offers, above all other forms of organising classroom based learning, is the opportunity for individual learners to develop the craft of interdependence (a communal sharing of knowledge and skills). An extensive evidence base exists which suggests that encouraging interdependence between learners promotes a shift from cognitive self-interest to mutual interest, a development in positive learning and social relationships and an increased openness to being influenced by and influencing others. The Set stimulates socialised-learning and through this interdependence and its many benefits. Interdependence however does create conflict, social and cognitive, but evidence suggests that this conflict provides learners with the opportunity to strengthen their cognitive powers and develop social skills such as social mediation. Social mediation needs to be learnt through dealing with social challenges. For some however it needs to be taught. Intervention work attending to this capacity through a taught curriculum, especially when students begin to experience Collaborative Group Learning for the first time (ideally within Year 7 of secondary education) and through a pastoral curriculum delivered perhaps by a teacher/tutor/learning mentor assigned to the Learning Set is an important feature of learning to learn as, with and because of the group. I have begun to collect evidence of where this approach to intervening in the development of social mediation and group relations has proven to have a positive result on a group’s capacity to work more effectively as a Learning Set. These suggestions are supported by Johnson and Johnson (2008) who found that learners engaged in socialised-learning spent considerably more time on task and tended to be more involved in these activities, attaching greater importance to success, and displaying a greater willingness to learn. A potential reason for this could result from social-indebtedness, or positive peer-pressure; reciprocation stimulated by sharing and a desire to please those considered socially important. This area of positive peer-pressure relates significantly to underlying structures of power and notions of generosity. Identity forming and reforming is an important aspect of an adolescents cognitive and social development, as is being highlighted by the latest research in the field of adolescent neuroscience. A Learning Set has the potential to fully exploit, positively, this identity forming stage within an individuals development; socially and neurologically. When fully exploited the Learning Set also offers the opportunity for knowledge-construction, meaning making through dialogue, identity forming and the development of the vital capacity of self-direction, all key features of a Collaborative Group Learning Pedagogy seeks to facilitate. This is merely a small sample of the social, cognitive and academic benefits of learning with, through and because of the Learning Set construct, yet it does begin to highlight that designing learning experiences to fully utilise the power of the Learning Set could reap huge rewards for learners in all aspects of their development to becoming Liberated lifelong-lifewide Learners. When constructing groups the size plays a large role in shaping what type of learning can occur. Large groups of seven facilitate effective dialogue. This is due to the generation of decreased risk with increased size. However large groups often prevent all from contributing, some through choice, epitomised by the principal of social loafing, where an individual offers little but expects much. Such groups also don’t facilitate the generation of social-indebtedness and as such interdependence is diminished. Small groups of 4 or less fail to offer opportunities for consensus building and restrict the availability of differing standpoints or varying skills sets. Evidence also suggests that such groups subdivide, pairing off, offering little group cohesion and halting the optimal state of Cooperative and Collaborative Group Learning. provides opportunities for trial and error, and it provides a safe environment for asking questions, expressing opinions, and taking risks…since each student brings unique strengths and experiences to the group, respect for individual differences can be enhanced. This view is supported by Bruffee (1993) who suggests that studies indicate that six is the optimum size for cooperative consensus building (an effective means of generating interdependence and an important feature of a Collaborative Group Learning pedagogy). Six also offers other learners a degree of security when completing collaborative tasks. If one learner fails to contribute, the learning of others within the group is not seriously hampered as it merely returns to the optimum of 5 participants. An application of this principle to Learning Set construction applied since 2012 to the formation of Learning Sets comprising over 400 children aged 11 to 14 is revealing what can be possible when a group consists of 6 learners working together to achieve both common and divergent learning goals. As such a Learning Set of 5-6 offers the ideal size for generating the type of beneficial learning outlined above and learning which begins to be truly collaborative in nature. The longer a cooperative group exists, the more caring their relationships will tend to be, the greater the social support they will provide for each other, the more committed they will be to each other’s success, and the more influence members will have over each other. The longer individuals spend in each others company the more they come to truly know one another, becoming perhaps a true community or family of learners. Getting to know one another can build stronger relationships, can increase emotional security, safety and with that enhance learning. It also means that each learner sees the other across a range of settings, seeing them as the most able in one subject and in another as someone who can benefit from their assistance. This can build generosity and both an opportunity and willingness to teach each other across subjects where they feel confident and able to help another they have a relationship with. This could potentially grow to create equality in power. Maintaining the longevity of these groupings could be challenging to most institutions as it may require fundamental restructuring. However the principle stands if a teacher wished to apply the Learning Set model to their classroom, a head of department to apply it across their department, across a faculty or if a head of school wished to apply it across a year group. I believe that f a Learning Set can be in each others company across more than one subject area and across more than one year of shooting the benefits will be greatly enhanced, however benefits can still be reaped to apply the construct to a single class for a single year. Where maintaining the Learning Set across subjects and over time has been applied evidence is emerging to suggest that it is having a positive impact upon positive learning behaviours, social-cohesion and group progression. Social-constructivist/constructionist thought suggests that a novice should learn with and from an expert, with each benefitting from this interaction. What is being suggested is inequality in skill and not power, appreciating that every learner is a novice and expert in different contexts. Attention can be drawn to this when Principle 2 is applied to Learning Set construction. The most effective social interactions are those where joint problem solving between asymmetrical learners occurs. Initial dependence on the more able other (fellow students within the Learning Set) will evolve into interdependence and eventually independence; in Vygotskyian terminology the thinking process has moved from being other-regulated to being self-regulated. This supports a view that the group should be academically, developmentally and culturally heterogeneous, as learners at different stages of development, possessing differing skills and attributes can all benefit one another; the ‘more able’ enhance their skill/knowledge through application and the ‘less able’ develop those skill/knowledge through being tutored. This organisation can result in their being as many ‘tutors’ as students. Heterogeneous groups also help enhance the verbal communication skills of weaker students as they learn the language of the ‘more able’. Intellectual difference is of great benefit when the main purpose of the group is to solve problems or to clarify or elaborate. Heterogeneous groups can provide opportunities for group support, encouragement and assistance and generates dissent and discussion due to conceptual conflict rather than conformity resulting from a culturally mixed group, all of which affords learners with opportunities to develop a wealth of attributes beneficial to learning. As such by constructing Learning Sets with members of varying skills attributes and capacities we are able to shift the learning relationship from being teacher-learner to learner-learner; truly learner centric and on its way to being Liberated Learning. An interesting aspect of this is the deliberate creation of dissent. This is not something most teachers or schools want with conformity the usual modus of many an academic institution. To embrace dissent at the level of the Learning Set requires a degree of power to be relinquished and for teachers to adopt a role as mediator. facilitating disagreement, debates and helping learners deal with difference becomes an important role of the teacher when promoting a Collaborative Group Learning Process and as such should be a feature of a Collaborative Group Learning Pedagogy. I am also beginning to consider how a learners ‘learning orientation’ or ‘attitude to learning’ can be collected and used to inform their placement within a Learning Set. This could offer a means of forming a more sophisticated heterogeneity while also drawing to a facilitators attention students more and less predisposed to learning as, with and because of the group; perhaps activating monitoring and early intervention strategies. In summary, utilizing a sustained, heterogeneous Learning Set of 5-6 in learning spaces has the potential to be a ‘Trojan Horse’ for the effective development of a huge wealth of capacities and attributes crucial in the development of UCL Academy’s lifelong-lifewide learners. The challenge for the Academy and teachers lies in how best to fully utilise and “exploit” this construct to the benefit of every learner.